You are currently browsing the category archive for the ‘Kimberley’ category. I can’t recall the last time I attended a concert in the great outdoors, but it has been quite a number of years since I stood among a throng of people listening to live music. The concert last Friday night was so meaningful to me that I abandoned the comfort of home and whatever was on TV to venture into the City, to get up close and personal with thousands of strangers on a Spring evening. I’m very glad I did. The concert was completely free, but the intention behind it was to solicit funds to protect the Kimberley region of western Australia. For those with good memories who have been following this blog for awhile, it will be obvious why I felt the need to be at the concert. 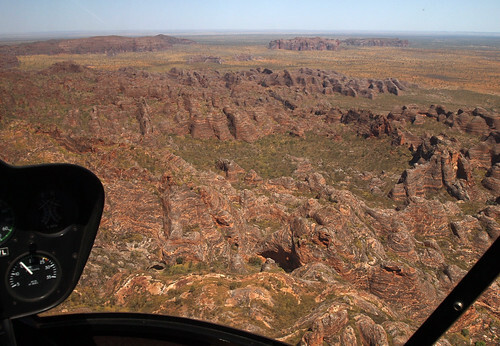 The Kimberley is a spectacularly beautiful part of this country with very few people. I went on an eight-day tour of the area three years ago, in addition to spending a couple days in Broome and going up to the Dampier Peninsula, where they want to build the plant. It is hard to spend any time there and not feel, as I did, that the land is truly sacred. Naturally, a consortium of companies wants to build a huge gas plant along a pristine part of the coastline, directly across the largest dinosaur footprints in Australia, adjacent to the world’s largest calving area of humpback whales. As the proposed gas hub is one of the largest industrial projects in Australia’s history and will become the largest gas hub in the world, one would expect the environmental impact assessment to be well considered, comprehensive, robust and based on sound science. Unfortunately the EPA’s assessment fell far below these expectations. It was, essentially, made by one man. All the other members of the committee had to recuse themselves because of conflicts of interest. This is all at odds with the state premier Colin Barnett’s description of the area as an “unremarkable” piece of coastline. The prevailing attitude of those in power in Western Australia is identical to that of the premiers and governors in the Western United States and Canada, it is our right and duty to ravage the land. Animals and natural landforms and archeological sites simply get in the way. The excuse is inevitably that the region needs jobs, money and development. What else could possibly matter? 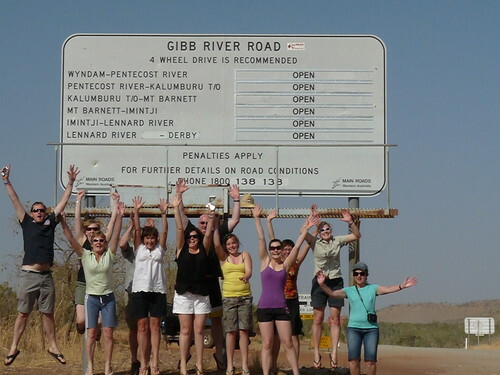 I would be very surprised if any more than one in twenty of those attending had actually been to the Kimberley. Australians don’t travel all that much in their own country, since it is a lot cheaper to fly to Bali or Thailand than see the Kimberley or the Ningaloo Reef. But as one of the spokesmen at the concert pointed out, Aussies don’t send postcards of giant holes in the ground or great gas plants to their friends and relatives overseas. Even if they were attending for the free music, they knew their country had to be protected. Enough damage has been done. It is time to protect the beauty and the wildlife that remain. Check out my Kimberley set of pics on Flickr, http://www.flickr.com/photos/jhalbrook/sets/?&page=2. See if you don’t agree it deserves a chance to stay just the way it is. No one knows exactly how it got its name, but the Spanish sounding word puts one in the mood to enjoy the amenities of the million-acre (4000 square kilometer) former cattle station (ranch). 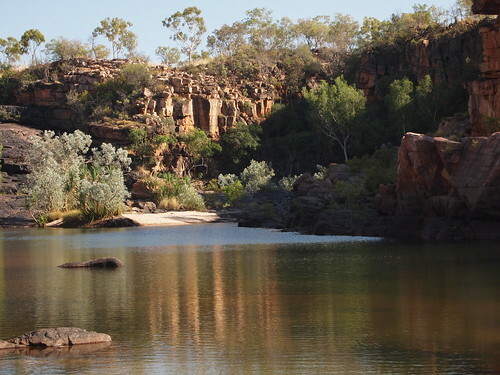 El Questro is a Mecca to those traveling through the Kimberley. There is a store, a well-equipped toilet block with hot showers and laundry facilities, an outdoor bar and even a restaurant. The youngsters who lead tours and take care of the place congregate at the bar in the evening. We are fortunate to be here at the end of the season. Our guide’s description of the bar at the height of the season beggars belief. People stacked up in unruly queues four or five deep like belligerent bees around fragrant flowers. In the interests of maintaining its historical narrative as a Texas-size ranch, a handful of cows and other critters wander at will. There is a notice warning about a horse who seems to trouble campers from time to time. Those who can sleep through the raucous crows and corellas will have trouble dozing through the unmistakable, mournful bray of a donkey. 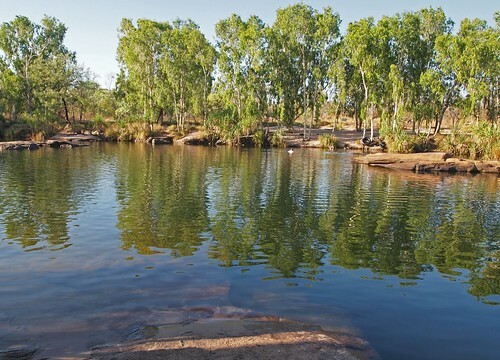 El Questro was established in its current form in 1991 by Will and Celia Burrell. 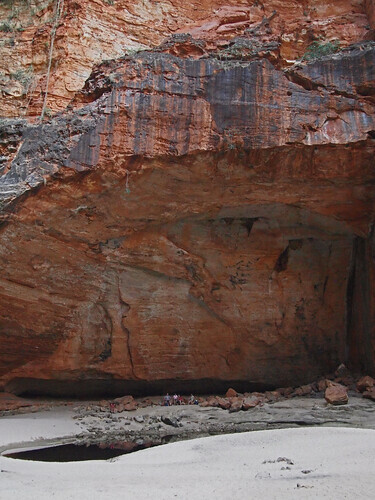 There are five rivers flowing through the vast property, hot thermal springs, deep gorges, waterfalls and a wealth of rock art from the Wandjina period. In addition to the campgrounds, there are luxury accommodations that we are encouraged to try when we are feeling flush. Each night in one of the six rooms (all meals included) goes for $2,500. There is a minimum two-night stay. Four of us sign up for the Chamberlain River cruise while the more ambitious members of the group head out for a gorge scramble. Two others elect to stay in camp and take it easy. We will dine at the Steak House this evening, so we have a lot to look forward to. The river trip is exactly what the doctor ordered. 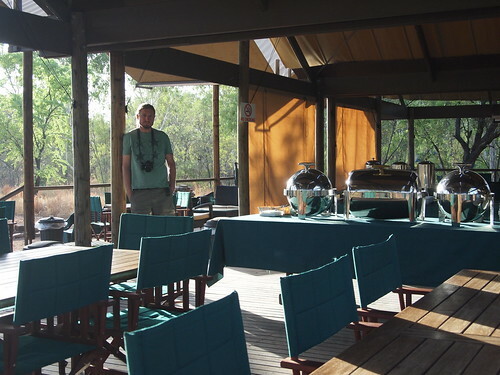 The El Questro guide does his best to convince us that the people who stay in the five-star accommodations are ordinary folks, indulging themselves on that special occasion. Once we are on the boat, the sales pitch drops away and we listen to the river. This is crocodile country, and we see a few “freshies” on the way, as well as birds and flying foxes. At the spot where the boat turns around the guide draws our attention to the water. Seven-spot Archer fish surround the boat. They live off airborne insects that they bring down to the water by ejecting a stream of water. The boat handlers bring pellets of food for them, so they soon begin spraying everything they can spot that is light and shiny– glasses, camera lenses, or, in my case, a bushy white beard. 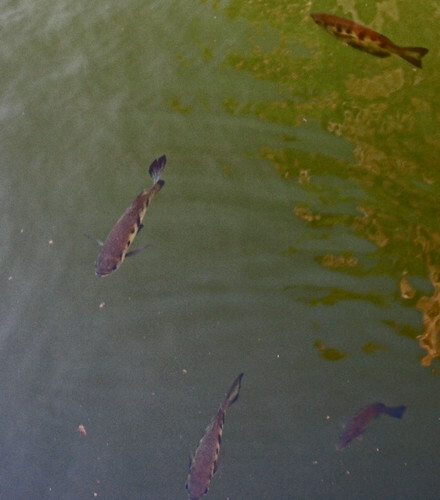 The swarm of little fish soon attract larger fish and turtles. 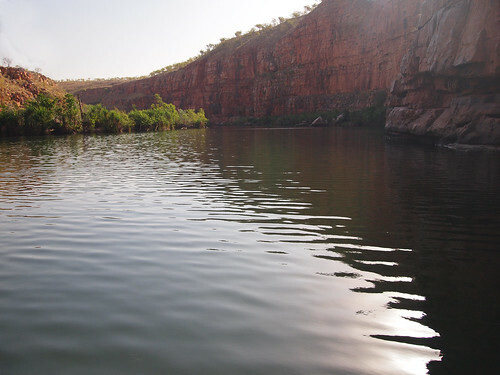 It isn’t long before the guide spots a barramundi cruising along the bottom. Except for the crocodiles, these fish are at the top of the food chain. While we feed the archer fish and indulge our childish delight in being sprayed in the face, the crew breaks open bottles of sparkling wine and fresh-cut fruit. We sing “Happy Birthday” to a 74 year-old man who looks like he may be a visitor from India. On the return trip the guide regales us with tales of crocodiles. There have been a couple of close calls at the Park. The scariest story is about a couple who were out in a canoe. 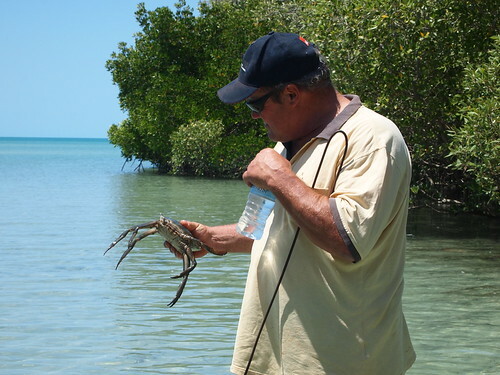 A saltwater crocodile followed them and as it approached the man attempted to give it a swat with his paddle. He missed the beast but overturned the canoe, dumping his wife and himself in the water. They both swam like crazy for the bank, certain they were going to feel the jaws at any moment. The thing that saved them was their lunch, which spilled out of the canoe in a separate bag, right in front of the snout of the crocodile. At dinner that evening, we tell stories of close calls with animals and strangers. Kylie tells us a frightening tale involving a hippo in Africa. I am reminded that despite our fears of things that eat us– animals such as crocodiles, bears, sharks, and hippos, we are rarely at risk from these creatures. That may be why we watch horror movies and leap out of airplanes. We are at the top of the food chain. Barramundi is on the menu and I am absolutely delighted. 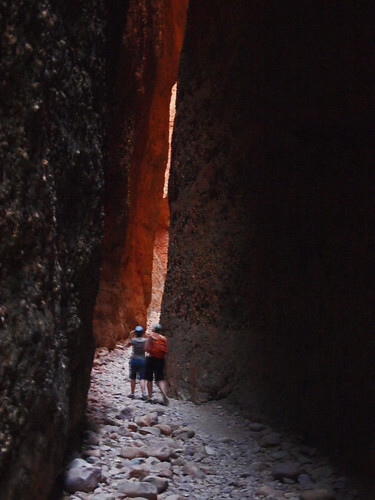 On the evening of the second day, Anthony tells us that the hike to Manning Gorge will not be on the group itinerary. He doesn’t think it worth the effort at the end of the dry season, and if we leave by 9 AM we can make it to El Questro before dark. We are welcome to do the hike if we want to, but he wants us back by 9. “Nine to five” takes on a whole new meaning when you are on an extended camping trip, especially when you are sleeping out under the stars. Most of us are in bed by nine and up by five, when the birds began to squawk. It starts to get hot well before seven. The hike itself begins with a swim across the river. Styrofoam boxes are stacked by the bank, essential if you want to keep your boots and clothes dry for the crossing. There are four of us who decide to go for a hike about the same time, not really caring if we arrive at the gorge, simply wanting some exercise before the bus ride. One by one, we slip into the water like beavers, pushing our precious cargo through the placid water to the other side. 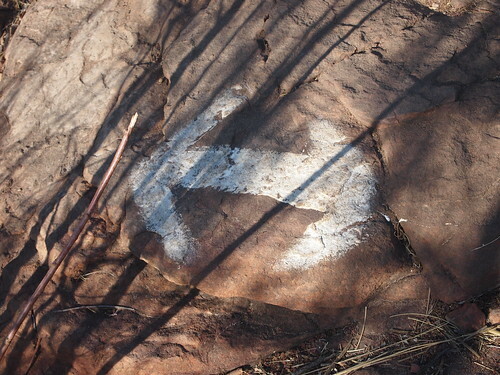 We dress quickly and head down the trail, which seems to be nearly all rock, and would be impossible to follow without the numerous markers that guide the way. We should be able to reach the gorge and get back in time, so long as we don’t dawdle. Brian, Kylie, Lynne and I come across Bronwyn on her way back from the gorge and she confirms our estimate. There is no shade, and the sun is already high enough to feel hot. Perhaps we are going a little quicker than I am comfortable with. Searching for clues in retrospect is foolish, but it is difficult to resist the impulse. Two weeks earlier, I had my second cataract operation. The second lens has a different focal length than the first and this may have thrown off my depth perception. At Bell’s Gorge I tried to reach the bottom by swimming down from the surface and came up with a punctured ear drum for my trouble. I may be 64, but like most men, I can behave like a teenager at times. We finally reach a ridge and the pool in the gorge spreads out beneath us. We sip some water and start down. That is when I miss a step and do a somersault among the rocks. Ten minutes earlier I had tucked my camera into its protective pouch. Now I’m flat on my back looking up at my concerned companions. My mind goes elsewhere for a long moment. I take stock of my body. It seems to be intact. Nothing is broken. I am sore and winded, but my awareness returns after the odd absence when I seem to have been in another place. Brian, Kylie and Lynne help me to my feet and take my pack. We rest awhile, before continuing the descent, more slowly. I am grateful to be alive. I don’t realize until I get back to the bus that my arm is bleeding. By then, the puncture has swelled to something the size of a small egg. Accidental falls are the number one cause of death in the wilderness. I have been very fortunate, missing several large rocks and landing on my backside, not my head. For the remainder of the trip I’ll be nursing a sore bum, arm and fingers. My buttocks will be black and blue for a week or two, but I’ll live to tell the tale. For that I will always be grateful. There are lightning storms and cyclones, wild asses and rogue bulls. If you were trapped out here without shade and water during the dry season you would die in a day or two. It is not a comforting thought. There is safety in numbers for those of us who are ill-equipped to survive in the outback. It helps to have a well maintained 4 wheel drive vehicle as well as an experienced guide with a SAT phone. The aboriginals survived for thousands of years without any of what we consider the “essentials,” but they have 40,000 years of inherited experience at living on the land. The unforgiving landscape nudges my mind hack to my childhood in Montana, with its endless vistas of cattle and sagebrush, rattlesnakes and gopher holes, but the similarities are deceptive. This country is dotted with spinifex, not harmless sagebrush, and the snakes in the Kimberley make rattlers seem like amateurs in the art of self defense. Unlike Montana, this is an ancient land, unchanged by volcanic activity since the ocean began to recede. Its scale challenges all sense of perspective. How does one imagine the towering cliffs of the Napier Range as a vast reef under the ocean that covered this part of the continent? How does one picture a cattle muster, where the livestock are spread out over a million acres? It is reassuring to be with a congenial group. We are homogeneous in many respects, but mixed in age, ranging from eleven to sixty-four. I can’t claim much wisdom, but I am the elder in the group. Bronwyn, Lynne and Brooke are all teachers from various Melbourne suburbs. I will not take the liberty of guessing their ages, but Brooke is the baby by far, still heading off on early morning runs and scrambling over rocks like a mountain goat. Brian and Kylie hail from Adelaide, with successful careers in the postal service and pharmaceuticals, respectively. Dave and Kerri have brought along their two daughters, which elicits a certain amount of good-natured grumbling from time to time on both sides of the parental divide. It is to be expected. And last, but not least, our Lithuanian sisters, Margarita and Regina. Both are doctors with different specialties, and they seem to have seen a great deal of the world already. 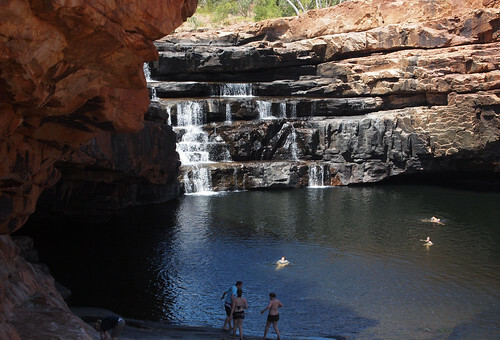 Our destination for the day is Bell Gorge, one of the largest and most beautiful swimming holes in the Kimberley. It is a popular place. Fortunately, its size easily accommodates the numbers of people who find their way here at this time of year. We shed our clothes and dive in. Who can resist a pocket of paradise, an oasis in a dry land. There were a baker’s dozen of us, including Anthony, our guide, driver, cook and mentor for the journey. There were ten Australians, two Lithuanians, and me. The big bus could pack in 20 passengers, but I suspect most of us were grateful we had come at the tail end of the tourist season. We could spread out, put most of the backpacks on the back seats, and relax. Our destination for the day was the 350 million year-old Napier Range, once a Devonian reef, out along the Gibb River Road. 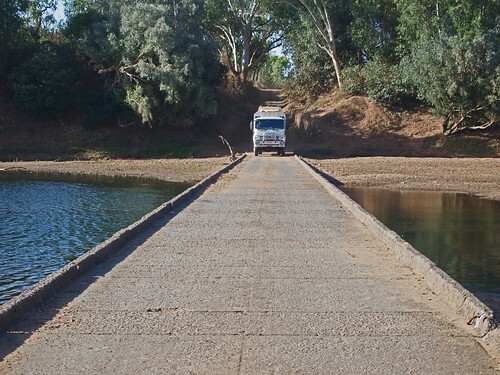 The western end of the Gibb River Road starts in the town of Derby, but it doesn’t really hit its stride until the macadam disappears. When the bone rattling begins, you pull out your map and realize that you have another 600 kilometers to go. The vast expanse on either side is the proverbial Outback. It is barren cattle country, punctuated by giant termite mounds and swollen Boab trees. Along the way, our guide begins a history lesson on the life and times of an aboriginal named Jandamarra. This extraordinary man was a member of the local Bunuba tribe. As a young man, his skill with horses earned him a good reputation on cattle stations in the region, eventually bringing him to the attention of the police, who hired him as a bounty hunter. When he was engaged to capture and imprison a large number of elders, including his revered uncle, Jandamarra’s tribal loyalties came to the fore. He killed a policeman named Richardson, stole guns, and set his prisoners free. It was the beginning of “The Bunuba War,” one of the few organised armed insurrections against European settlement. Our visit into Tunnel Creek is peaceful and beautiful. There are bats hanging overhead in the hundreds, but no crocs to worry about. 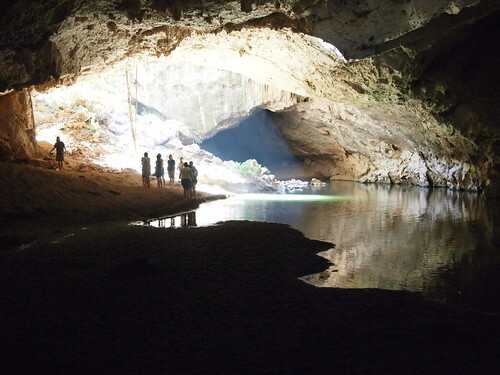 We make our way slowly through the cavern with the help of torches (flashlights), wading through the shallow water. A collapsed roof lets in the light, revealing a cathedral of limestone. We wind up our first day in the campground at Windjana Gorge. The Gorge is beautiful, but in my haste to change shoes I have forgotten my camera. Freshwater crocodiles enjoy the last warmth from the setting sun. Back in camp, Anthony starts throwing down tents and swags (sleeping rolls), and setting up camp. It will be dark soon and dinner will be very welcome. It is as large as Germany with a permanent population of about 45,000. Paved highways are the exception rather than the rule, so when you travel on one you see virtually everyone moving along the same direction in the outback. The region was featured in the film “Australia,” which took some hits for its script and direction but not for its scenery. 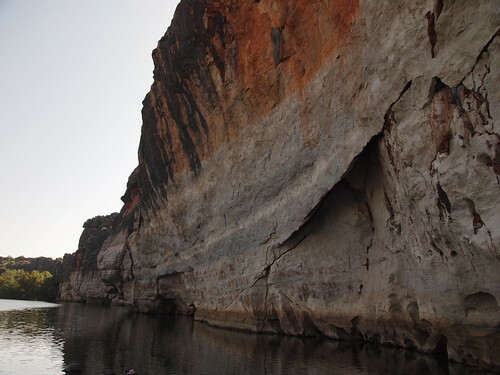 The Kimberley is spectacular. At this time of year, it is also very hot. The day before my departure from the region, I woke in the hottest place in Australia– Fitzroy Crossing. It was 46 degrees C, or 115 degrees Fahrenheit. My journey began with a long flight directly across the country to Perth, then north to the town of Broome, which is only 17 degrees south of the equator. The airport is a casual affair, looking like something out of Africa rather than Australia. When I asked about getting a taxi to the Broome Motel, a burly man who seemed to be in charge of the local transport said he would take me for $5, but I could save myself the bill and walk. It was dark and I was tired and I didn’t want to get lost. Five dollars seemed a small price to pay for being delivered to my bed. The Broome Motel is handy to the airport and the old part of the city, now known as Chinatown. The resorts are located in the more desirable area of Cable Beach, named after the underwater telegraph cable that was laid from Broome to Singapore in 1889. It was a significant event in Australian life, bringing news from England to Sydney and Melbourne in a matter of hours rather than weeks. 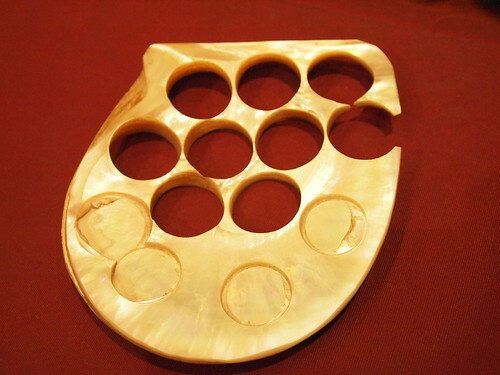 The town owes its existence to the discovery of pearl oysters in 1861. It is a town built on buttons. 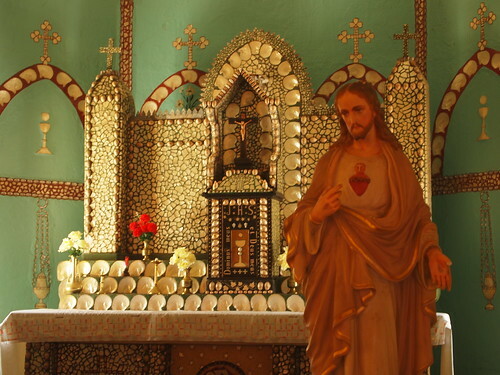 Before the advent of plastics, people of quality demanded long-lasting, beautiful buttons cut from mother-of-pearl shells. The pearls were rare, a bonus to the lucrative shell trade but hardly the source of income they have since become. Today, Broome is a tourist town, capitalizing on its wonderful weather during the Australian winter, its beautiful beach resorts and other tourist attractions that have been added to the mix over the years– camel rides, a Crocodile Farm, star gazing etc. The profit from resort rooms has undoubtedly eclipsed the trade in buttons and pearls over the years. It’s the new economy. Thanks to the high tides in the area, (second only to those in the Bay of Fundy), the early days of gathering oyster shells was easy. When the early pickings were exhausted, aboriginals were enlisted to do the difficult work of diving. “Blackbirders” were engaged to enslave the natives. Women and children were valued because they were compliant. The invention of diving suits changed everything, since the aboriginals refused to be confined inside the claustrophobic outfits. Asians from Malaysia, Indonesia and the Philippines were enlisted to do the dangerous work. Ultimately, Japanese divers proved themselves in the depths, but the cost was great. There are 919 divers buried in the Japanese cemetery. Many more lost their lives at sea. In its heyday, there were 400 pearling boats lined up along the shores of Roebuck Bay. The Depression and World War I hit the industry hard, but World War II and the invention of plastics did it in completely. On March 3, 1942, Broome was strafed by Japanese fighters. Nine Zero fighters swooped in and destroyed sixteen Allied amphibious planes (flying boats) which had just landed, and seven planes on the runway. Over a hundred people died. The town was evacuated in the expectation of a Japanese invasion. Most of the pearl “luggers” were pulled up on shore and burned so they wouldn’t fall into the hands on the invading force. The industry never recovered. My visit falls at the end of the tourist season, before the “wet,” when lightning storms and cyclones add drama to the skies. These days it seems a lazy place, populated by backpackers and aboriginals and baby-boomer tourists like me. There are double-decker bus tours, sea kayaking trips, trike flights, sunrise and sunset camel rides,a pearl farm tour and micro breweries to visit. There is the sunset (Earth rise) over Cable Beach. That is not to be missed and it is absolutely free. On a tour of the town I am amazed at the size of the place considering its minuscule permanent population of around fourteen thousand. Many of the new developments are very expensive, which suggests a large number of second homes. It is hard to believe that the good citizens of Broome can afford million dollar properties. It has been many years since the zoo was displaced to make room for development. Now, it appears the Crocodile Farm is heading for the outskirts of town. Apparently, saltwater crocs don’t make the best neighbours. Its a jaws thing. Stay tuned. There is much more to come.